We are lucky to have so many beautiful trees in our villages – but sometimes they need a bit of extra looking-after, or even removal if they have become unsafe. Family-run business Hopwood Tree Services specialises in all aspects of tree work, from topping, thinning, reductions, pollards, lifts and cut-backs to felling, removal, and stump grinding, as well as tree inspections. 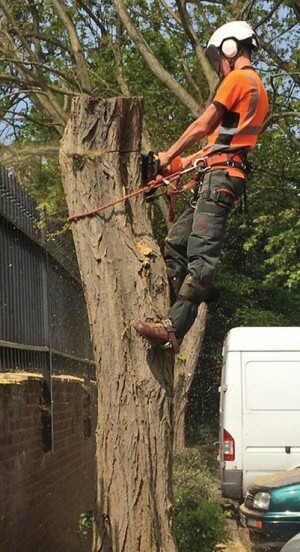 Devon Finney and his father David set up the firm in 2010, based on their previous experience, and the business has grown and grown, carrying out tree work for domestic and commercial premises and Local Authorities. Devon and David strongly believe in employing young local apprentices, who can hone their skills by learning on the job and contributing to the firm’s excellent reputation. The team are NPTC (National Proficiency Tests) qualified, and the firm is also endorsed by Check-a-trade.com, which carries out background checks to vet its members, giving extra reassurance to customers. Hopwood Tree Services is insured for up to £10million, largely due to the Local Authority work it carries out. This includes work for Alvechurch Parish Council, such as clearance work in The Meadows. The company also offers a 24-hour call-out service for emergencies, and the team were kept particularly busy after Storm Doris, clearing fallen trees and branches so that roads could be re-opened.